Our promise is to always exceed your expectations from initial design consultation to the final completed project. Our philosophy is simple: it only takes a little longer to do it right. 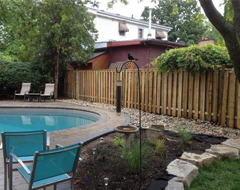 At DB Fence & Deck we continuously strive to build a name and reputation as one of the most innovative fence building and deck construction companies in London Ontario. DB Fence & Deck designs builds unique and affordable decking, fencing, stairs, pergolas and other custom outdoor living spaces in London Ontario. We are dedicated to using only the best materials, construction techniques, and craftsmanship. From the initial quotate through to completion, our highly experienced and skilled professional service will help you to achieve the best results possible. You and your job will always be treated with a professional, friendly approach. DB Fence & Decks ensures every job is taken with the utmost precision, no matter big or small and you can count on the service to be courteous and thorough. DB Fence & Decks offers something many bigger companies have forgotten; personalized service. We strive to give you the best possible person-to-person interaction in addition to the highest quality deck your money can buy.